WASHINGTON, D.C. – The Hispanic Association of Colleges and Universities (HACU) praised today’s vote by the United States Senate for legislation to help close the “digital divide” between minority and non-minority students on today’s college campuses. The Digital and Wireless Network Technology Program Act, or S.196, was passed with a 97 to 0 vote by the Senate today and now awaits House action on the measure. The bill targets $250 million in new National Science Foundation grants each year for the next five years to those colleges and universities serving the largest concentrations of minority students. “We applaud the leadership and vision of the Senate for endorsing this urgently needed investment in our country’s Hispanic-Serving Institutions and other Minority-Serving Institutions, which are at the forefront of every effort to close the technology gap,” said HACU President and CEO Antonio Flores. “We commend Senator George Allen of Virginia for introducing this important legislation and urge members of the House of Representatives to join their Senate colleagues in efforts to ensure swift passage of this bill,” Flores added. 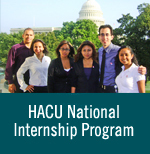 HACU represents more than 340 colleges and universities serving the largest concentrations of Hispanic higher education students in the United States -- including Hispanic-Serving Institutions, or HSIs, which have a full-time student enrollment that is at least 25 percent Hispanic. “In this high technology economy, we can no longer afford to tolerate a digital divide that threatens the college and career success of our country’s fast-growing minority populations. For Hispanics, the nation’s youngest and largest ethnic population, this legislation is a step in the right direction toward closing that gap,” Flores said. The leadership of HACU submitted and presented testimony earlier this year in support of S.196 as a valuable investment in historically under-funded HSIs and other Minority-Serving Institutions. Their lack of the necessary infrastructure and training support to effectively bring technology parity to under-served populations is a national concern. S.196 was introduced in January by Senator George Allen of Virginia as a bipartisan measure co-sponsored by Senators Ted Stevens of Alaska, John McCain of Arizona, Zell Miller of Georgia and Ernest Hollings of South Carolina. Of special importance to under-funded institutions, HACU testified, is a clause allowing a waiver of the traditional matching-funds requirement for higher education institutions with no endowment or with an endowment of less than $50 million in current value.